For an appointment contact me today. ﻿Mindfulness is a state of present-moment awareness that is learned and cultivated through intentional practice (often, but not always, meditation). Mindfulness is characterized by an open, non-judgemental, and curious inquiry into our experience of the present moment using all of our senses. This is in contrast to our typical mode of existence as humans, in which we are often ensnared in a cycle of distressing thoughts about the past and worries about the future. Practising mindfulness allows us to "watch" these distressing thoughts and emotions come and go with more equanimity, less reactivity, and with fewer of the negative consequences that are often associated with experiencing difficult thoughts and emotions. Although many people can experience immediate benefits from practising mindfulness (e.g., a sense of relief from distressing thoughts and emotions), this state of being can be further developed through the repeated practice of gently directing and channeling our attention towards aspects of our present-moment experience. Developing the ability to be more mindful can help us manage stress and pain, be more self-aware, and live with more presence, happiness, vitality, and well-being. A growing body of research shows that mindfulness is associated with reduced worry, stress, and emotional reactivity and better focus, mental flexibility, memory, and relationship satisfaction (Davis and Hayes, 2012). Research also shows that mindfulness improves anxiety and depression (Goyal et al., 2014). 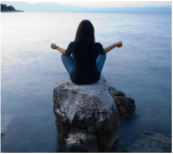 In mindfulness coaching you will learn concrete strategies and skills to help you develop and maintain a regular mindfulness practice and achieve the benefits associated with mindfulness. In the initial session we would start by assessing your current life situation and needs. I would then provide some information on what mindfulness is and how this practice can benefit and be integrated into your lifestyle. The content of my coaching sessions is based on the content of Jon Kabat-Zinn's Mindfulness Based Stress Reduction course. Following this structure, we would explore what mindfulness is though interactive exercises designed to give you an experiential understanding of this particular state of awareness. We would then do some simple mindfulness practises through guided, focused meditations. You will leave the session with a solid understanding of how to practice mindfulness and instructions, materials, and a plan for continuing a meditation practice at home that is tailored to your needs. Subsequent sessions will explore in depth, how mindfulness can help you cope with difficult thoughts and emotions, personal relationships, pain or illness, and everyday stressors with equanimity. This will be achieved through teaching, experiential exercises, and mindfulness and meditation practices that can be integrated into your daily life and activities. New mindfulness and meditation practices will be introduced each session to give you a range of options in your practice.